By no means restricted to the Scotsman, articles of this kind appear across the spring and summer of 1915 in a wide-ranging and robust discourse of health. In those pages of K which contain the non-English initial combinations Ka-, Kh-, Kl-, Ko-, Ku-, Ky-, these exotic words may be thought to superabound; yet it would have been easy to double their number, if every such word occurring in English books, or current in the English of colonies and dependencies, had been admitted; our constant effort has been to keep down, rather than to exaggerate, this part of ’the white man’s burden’. Murray’s comments can, in this, serve to reveal still other facets of the on-going discourse of history and the history of words (even within the OED). Nevertheless, khaki — with its heritage in Urdū khākī ‘dusty’, f. khāk ‘dust’ — was one of the words which was admitted into the Dictionary without question, being further picked out, in Murray’s prefatory ‘Note’ to the fascicle Kaiser-Kyx, as an ‘interesting word of foreign origin’ –even if, like similar forms, it is judged an ‘alien’ or temporary ‘denizen’ in ‘our language’. In the Dictionary itself, the entry is prefaced by the ‘tramlines’ used throughout the first edition to mark out words where naturalisation is in doubt. 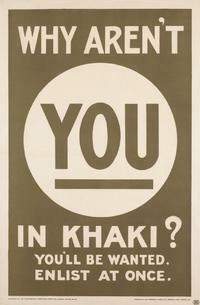 Khaki variously appears in supporting evidence within the entry as khakee, Karkee, Kharkie, or khâkee . Use in English is traced back to 1857 and ends in 1900, a point by which, as Murray notes, khaki, originally used for British Indian recruits in the mid-19thC, was, as in the Second Boer War, ‘a fabric … now largely employed in the British army for field-uniforms’. Life-savers. Language and self-protection in early WWI. Looking back at the events which had unfolded across Europe in recent months, the Scotsman drew attention in January 1915 to the ‘ingenuity’ which had been manifest in ‘man’s power over nature’ and the diverse ‘mechanisms of war’. Science, the Scotsman stressed, had led to a range of ‘new features’. Seen from the point of view of the Words in War-Time archive (in which this extract was included), such innovation was two-fold, demanding not only ‘ingenuity’ but a system of nomenclature by which inventions might be both recognised and claimed. Language and the material culture of war were densely interlinked.